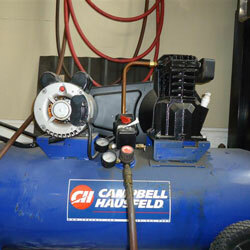 So, you have an air compressor in your workshop or garage. How do you make sure it stays working the way it should? 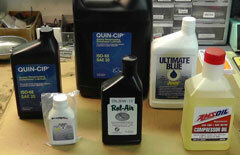 The key to keeping your compressor in great working shape is preventative maintenance. This isn’t rocket science. It’s just a series a steps to keep you up and running and adding longevity to your compressed air system. If your system goes down, what’s your downtime worth to you? Your answer is the cost of a breakdown. Do you know what your equipment needs? In the owner’s manual, there’s a set of maintenance procedures to help you maintain your compressor, no matter if you have a small or large air compressor. If you can’t find the physical copy, check the manufacturer’s website or a simple Google search. Unless you have an “oil-less” model, check the oil level each day of use. In some types of models (ie: rotary) a special lubricant will also need to be added periodically. Draining the moisture in your tank is essential to its longevity and needs to be done after each use. Your drain valve is located on the bottom of the tank but do not open the valve if your tank pressure exceeds 25 pounds. Pay attention to unusual noises, unusually slow filling time, unit getting real hot and certain vibrations or belt slippages. If you’re not handy enough to inspect and fix any of these issues, then contact a professional to correct the problem. When you’re dealing with high pressure, you need to feel comfortable in what you’re doing. Don’t forget to turn off the compressor at the end of the day at the power supply. While the above short list is rather obvious, there are some people as you know that just plug a piece of equipment into an electrical outlet and never think about the dangers of little or no maintenance. The weekly maintenance schedule is a little more detailed. Remove the dust and other matter from the cylinder head, motor, fan blades, lines and your tank. Clean the intake air filter(s). Remove the bolts and the guard to gain access to the compressor drive. You need to loosen the mounting hardware which attaches the motor to the base. Look in your owner’s manual to find the correct tension for the belt. At the midway point of the belt span, apply pressure with a belt tension checking device. If adjustments are required, go ahead and do so. You don’t want to forget the pulleys. Make sure of their alignment. Tighten the bolts for the mounting hardware of the engine and then reinstall guard and bolts. If you’ve kept up with the daily and weekly checklist the three-month maintenance list should be a breeze. Change crankcase oil with the right type. Using a sonic leak detector or soap and water, look for leaks around fittings and connections. Tighten any loose bolts and screws. Repair and replace worn parts. Release the ring on all pressure relief valves to make certain they are working properly. When you compare air tools versus electric tools, you’ll find that more maintenance is generally needed on the former. That said, maintenance is typically fairly simple and we hope these maintenance tips will help you extend the life of your air compressor and give you piece of mind as you use it. Thanks, good stuff. My cheapo Harbor Freight compressor finally bit the dust and I’m looking to invest in a “good” brand. I did zero maintenance on my old $80 compressor but looking to buy a nice Ingersoll Rand which I plan on taking good care of.